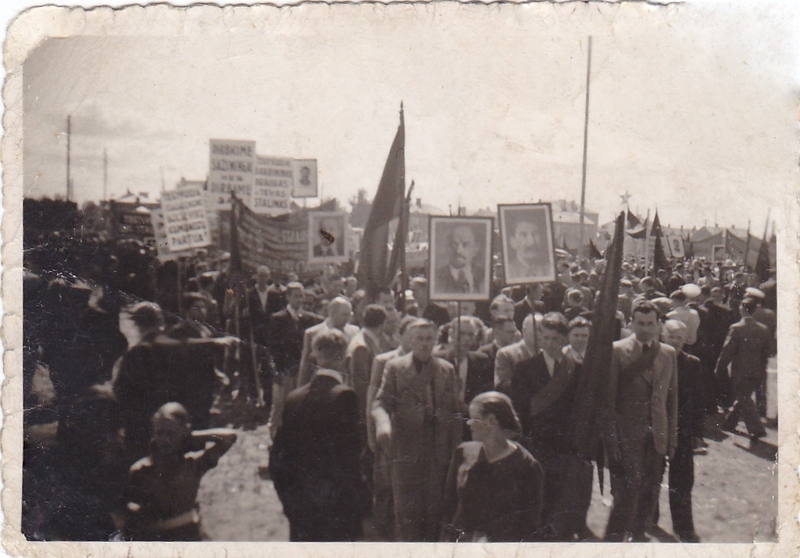 A picture above (taken in 1941 and found in my grandfather's/Hirsch-Meir Rachowitz's photo collection) shows a pro-Soviet rally. People carry posters with Soviet leaders, Lenin and Stalin, as well as flags and banners in support of the Soviet regime -- with political slogans such as "Tėvas Stalinas" in Lithuanian, i.e., "Father Stalin." With the outbreak of World War II and the return of Vilnius/Vilna (Vilnius and its surrounding area) to Lithuania, about 70,000-80,000 Jews were united with their relatives and friends from whom they had been cut off for 19 years (Vilnius was occupied by Poland in 1920 and Kaunas then became the temporary capital of Lithuania. Poland and Lithuania had no diplomatic relations until 1938 because of the Vilnius conflict! ), while the number of Jews in Lithuania substantially increased and reached 240,000-250,000 (in 1940), including Jewish refugees from Nazi- or Soviet occupied Poland. Actually, the Soviet Union seized Vilnius in September 1939 in accordance with the secret Molotov-Ribbentrop pact, then in October 1939, it returned the city to Lithuania, but annexed the whole country in June-August 1940, according to my Dad, Aaron-Israel Rachowitz. Lithuanian President Antanas Smetona and his family fled the country and a new pro-Soviet government was installed with Vilnius as the capital of the newly created Lithuanian Soviet Socialist Republic (SSR). The Sovietization of country caused huge harm to Jewish culture. Everything that had been created in Hebrew was banned: all Hebrew schools and gymnasia (children/students were transferred to Yiddish or Russian schools. My Dad, Aaron-Israel Rachowitz, who had studied in the Hebrew Real Gymnasium in Kaunas/Kauno žydų realinė gimnazija---please see my post "Hebrew Real Gymnasium in Kovno/Kaunas, Lithuania before WWII"---was transferred to Yiddish school, while his classmate, Eli Stoupel, to Russian school); institutions; yeshivas (an Orthodox Jewish school, college or seminary), all public organizations; all parties; etc. Jewish leaders, politicians, scientists and wealthy Jews were arrested or deported. Menachem Begin, pre-war head of Betar (a Revisionist Zionist youth movement) in Poland (later becoming the 6th Prime Minister of the State of Israel and Nobel Peace Prize laureate) was arrested by NKVD (predecessor of KGB) and detained in 1940-1941 in Lukiškės Prison, Vilnius, whence he was deported to the Pechora forced labor camp in north Russia.